Jakob Hald is the director general of the DCCA, appointed on 1 January 2016. Prior to that, Jakob Hald worked as deputy permanent secretary in the Ministry of Taxation for 2014 to 2015. 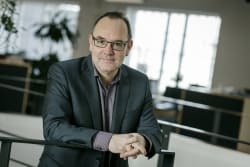 From 2011 to 2014, Jakob Hald was director general at the privately financed think tank Kraka, whose purpose has been to deliver independent analysis and solutions to contribute to improve the quality of the economic debate in Denmark. Before that, Jakob Hald was chief economist and deputy permanent secretary at the Ministry of Finance from 2003 to 2011, where he began as head of department in 1999. From 1997 to 1999, he worked as a chief consultant in the Ministry of Economy and prior to that he was a special adviser at the Ministry of Finance from 1992 to 1993. He worked at Statistics Denmark from 1992 to 1993 and at Danske Bank from 1991 to 1992. Jakob Hald graduated from the University of Copenhagen with a master’s in economics in 1991. Jakob Hald serves as external censor at the University of Copenhagen and is member of the Board at Statistics Denmark.